Today I came home from work and felt like baking something--something sweet and gooey and with chocolate, of course. I wasn't sure I had the proper ingredients in the pantry but forged ahead anyway. Without thought or reason, I started pulling things out and placing them on the counter. An Oreo cookie pie crust, a can of sweetened condensed milk... Then to the fridge and a plan started coming together. And here is how you can make it, too. 1. Remove plastic wrapper from pie crust. 2. 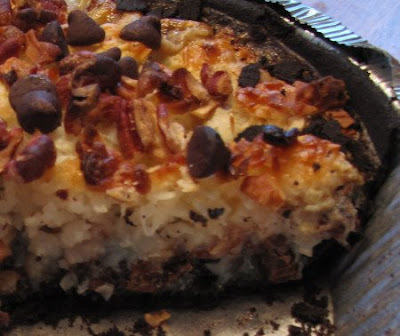 Cover bottom of crust with the chocolate chips. Reserve a few for the top. 3. Layer the pecans over the chocolate. Again, reserve some of the nuts for the top. 4. Layer the shredded coconut on top of the nuts. 5. Open the can of sweetened condensed milk and pour the entire contents over the top of the layers in the pie crust. Yes, the entire can. 6. Garnish the top with the remaining chocolate chips and nuts. 7. 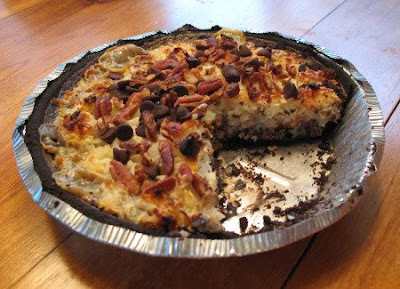 Place pie shell with contents on a cookie sheet. Bake at 400 degreesF about 20 minutes or until the top is bubbly and turning brown. 8. Remove from oven and let cool. When cool to the touch, pop in the refrigerator and chill until it's hard. Oh my! Shame on you for creating this!